I came across Blind Pilot in 2008 with their first release, 3 Rounds and a Sound. From beginning to end, it is one of those albums where I almost instantly liked every song. My first favorite on the album was "I Buried a Bone" and the others were quick to follow. There are so many great songs on this album, I had a hard time choosing a second one. Therefore, I decided to go with the title track, "3 Rounds and a Sound". Based out of Portland, Oregon, Blind Pilot is made up of Israel Nebeker, Ryan Dobrowski and their backing band. 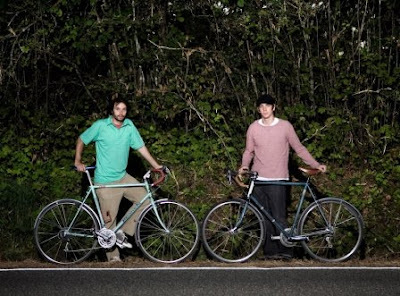 Aside from loving the music, I fell in deeper when I found out about their 2008 'Bicycle Tour', which took place in support of their debut. Starting in Bellingham, Washington, they took their home made bike trailers, made for carrying their instruments, and traveled south to San Diego, making over two dozen stops along the way. Over the last three years, I have always wondered why they haven't released anything else other than a live itunes only EP, which is very good by the way. Finally, they have announced a new album entitled We Are the Tide, scheduled for a September 13th release. The above video is just a taste, but it gets me excited. July 9th happens to be my birthday, and what a great way to spend it, and what a great venue to see them perform!